Claude Monet (1840–1926), Meules, fin de l'été (Haystacks, end of Summer) (detail) (1891), oil on canvas, 60 x 100 cm, Musée d'Orsay, Paris. Wikimedia Commons. By the middle of the 1800s, oil painting was finally changing. Although there were still those who painted in layers, painstakingly in the studio, according to traditional techniques, many now took their oil paints outdoors, carrying it in cheaper bladders or the new and more costly tubes, and painted alla prima – direct, all in one. What was even more remarkable was that the alla prima sketches and studies which were painted outdoors started to become accepted as works of art. Whereas Valenciennes had hidden away his superb oil sketches of the Roman campagna as a private reference, Corot, Delacroix, then the Impressionists exhibited them, and even got customers to buy them. The snag was that all your paintings had to look as if they were painted quickly, even those which had required several months work in the studio before they looked right. 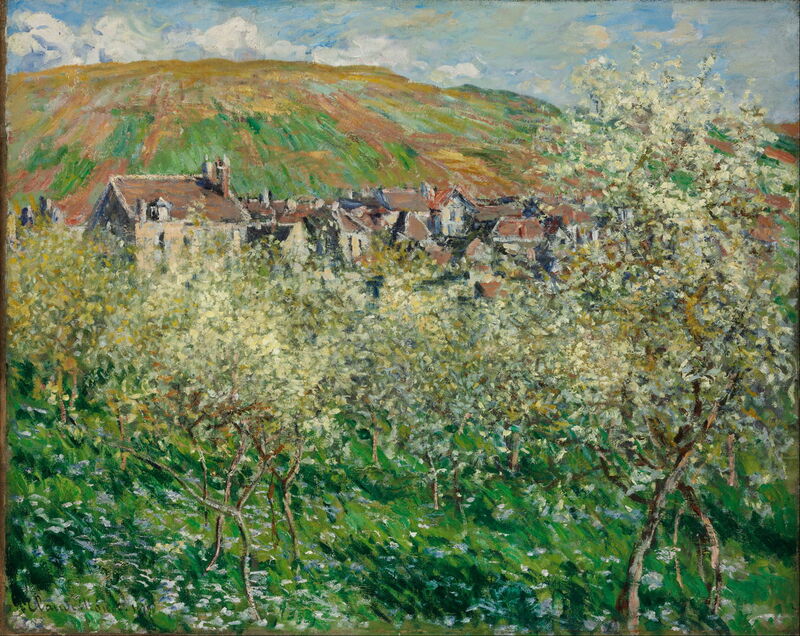 Claude Monet (1840–1926), Flowering Plum Trees (1879), oil on canvas, 64.3 x 81 cm, Szépművészeti Múzeum, Budapest, Hungary. Wikimedia Commons. 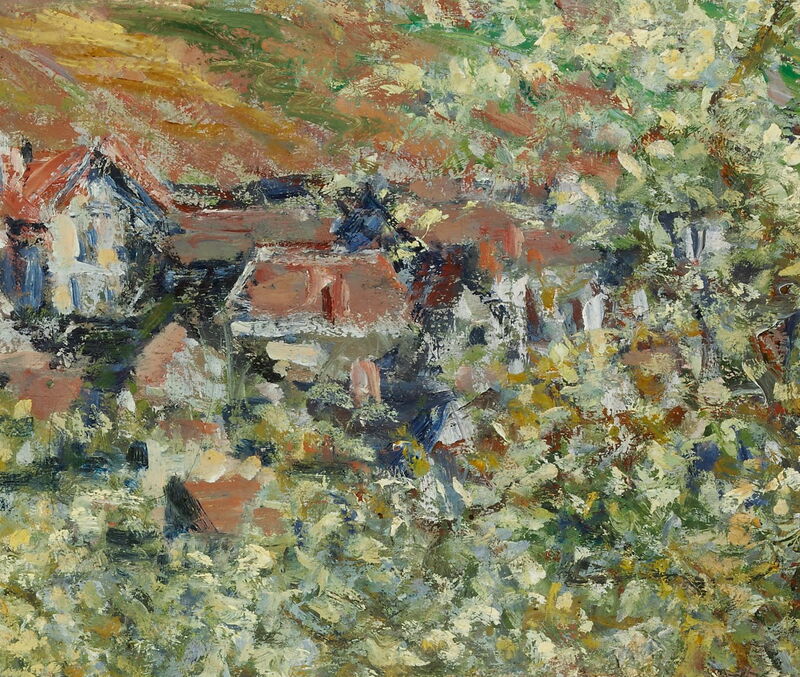 Monet’s Flowering Plum Trees (1879), for example, has a very complex structure in its paint layer, as seen from the surface in the detail below. Some marks have been added wet-in-wet, but many wet-on-dry, demonstrating that it must have been worked on over a period of weeks or months. Claude Monet (1840–1926), Flowering Plum Trees (detail) (1879), oil on canvas, 64.3 x 81 cm, Szépművészeti Múzeum, Budapest, Hungary. Wikimedia Commons. Perhaps the most convincing evidence is in his Grainstack series, which he worked on for several months as a co-ordinated group. Claude Monet (1840–1926), Meules, fin de l’été (Haystacks, end of Summer) (1891), oil on canvas, 60 x 100 cm, Musée d’Orsay, Paris. Wikimedia Commons. 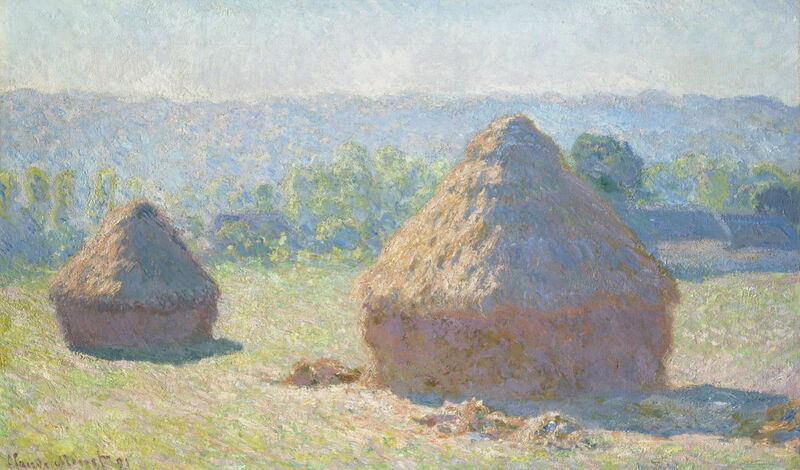 Monet’s Meules, fin de l’été (Haystacks, end of Summer) (1891) is one example of that series, whose detail (below) shows paint added on top of dry impasto layers in a very complex fashion. 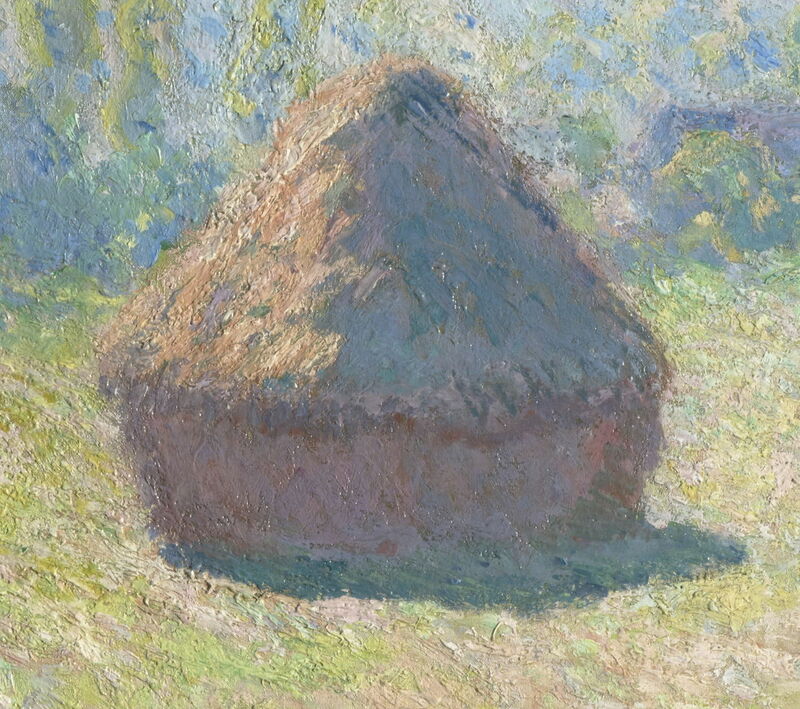 Claude Monet (1840–1926), Meules, fin de l’été (Haystacks, end of Summer) (detail) (1891), oil on canvas, 60 x 100 cm, Musée d’Orsay, Paris. Wikimedia Commons. The use of resins and medium modifiers such as Megilp, which had caused the paintings of Reynolds, Turner, and others so much trouble, was anathema to the Impressionists. Most relied on the paints sold in bladders then tubes by artists’ colourmen, from whom they bought their canvases too. True plein air paintings, completed in just one or two sessions in front of the motif, seldom ran the risk of quicker-drying oil paint being applied over slower-drying oil-rich layers. Other collective preferences also helped: many Impressionists disliked the idea of black paint, so asphalt/bitumen was seldom used. Even varnishing was frowned upon, although many of their works have been varnished rather later. As they were not trying to emulate the Old Masters, but paint the Impressionist way, there were few temptations to be led astray, in pursuit of ‘secret’ recipes which might threaten their paintings. Not every Impressionist painting has survived well (so far) though. Sadly, several of the newer pigments have undergone visible colour changes, and some of the Impressionists were not as mindful of permanence of colour as they could or should have been. 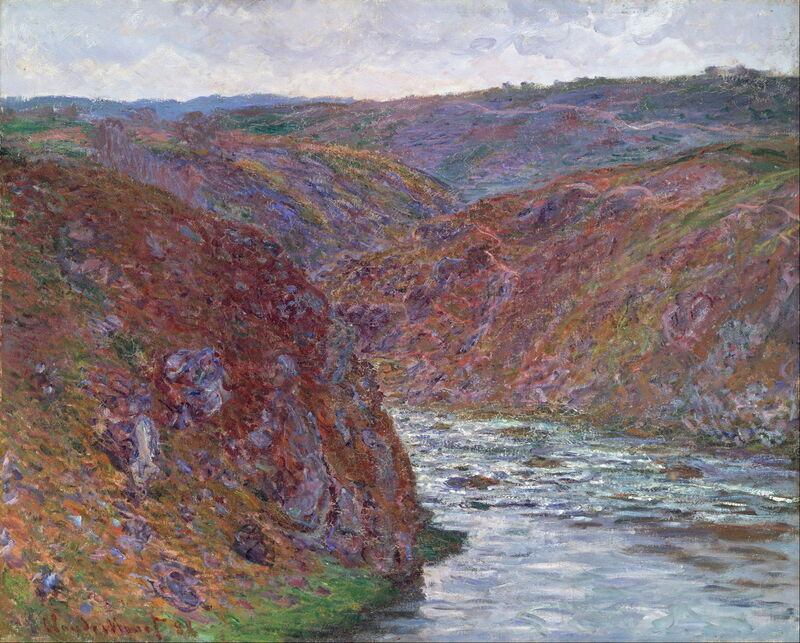 Claude Monet (1840–1926), Valley of the Creuse (Gray Day) (1889), oil on canvas, 65.5 x 81.2 cm, Museum of Fine Arts, Boston, MA. Wikimedia Commons. Occasional paintings, such as Monet’s Valley of the Creuse (Gray Day) (1889), from that earlier series, have suffered more structural problems in their paint layers, which may be the result of poor batches of paint, or even defective priming of their canvases. The cracking seen in the detail below is unusually bad, particularly for a painting which is little more than a century old. 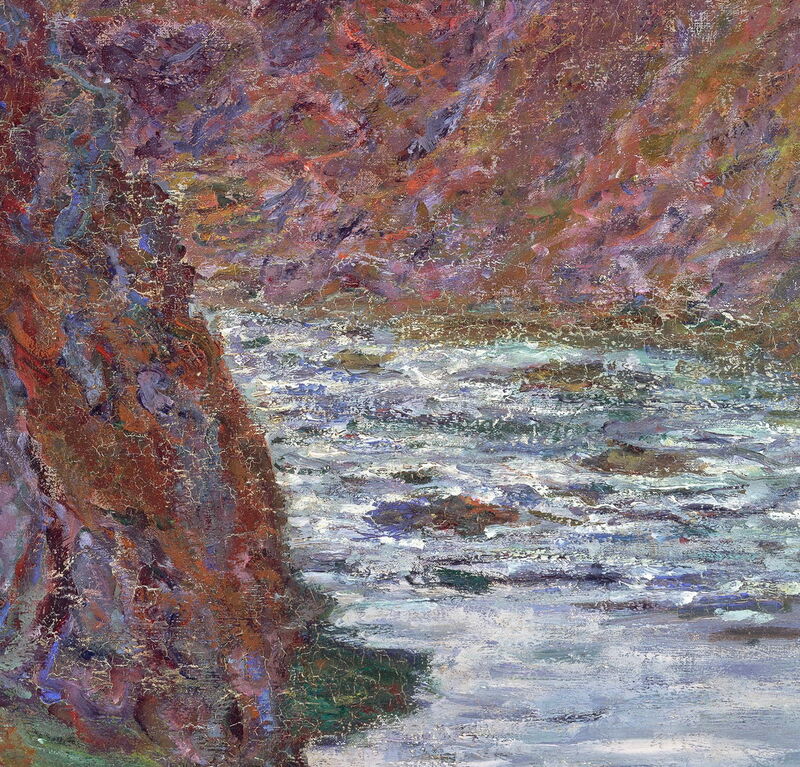 Claude Monet (1840–1926), Valley of the Creuse (Gray Day) (detail) (1889), oil on canvas, 65.5 x 81.2 cm, Museum of Fine Arts, Boston, MA. Wikimedia Commons. There was one unusual practice which was employed by Degas and some of his contemporaries, although most only seem to have tried it in a few paintings: what they termed peinture à l’essence. Tubed oil paints, particularly certain colours, can be a bit oily, and it seems that Degas and others experimented with reducing the amount of oil in their paints. Squeezing paint out of the tube onto blotting paper or rag and removing excess oil should not cause any problems, but peinture à l’essence took that to an extreme, in blotting out as much oil as possible, and restoring viscosity and flow by adding turpentine. 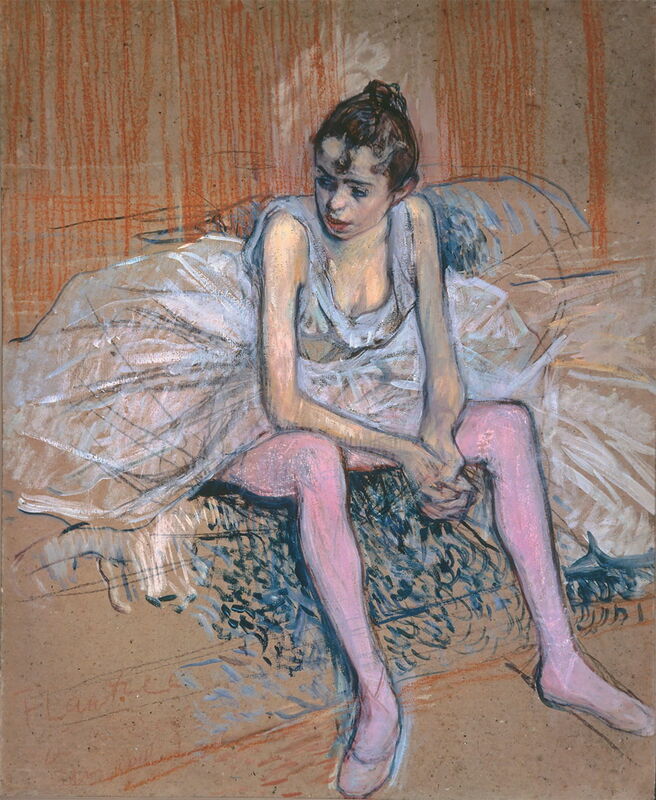 Degas’ Danseuse dans sa loge (Dancer in her Dressing Room) (c 1879) is one of his experimental paintings which uses both pastel and peinture à l’essence applied to canvas. The detail view below shows how thinly he applied his paint to the ground, although it is impossible to judge from that how well it is adhering. 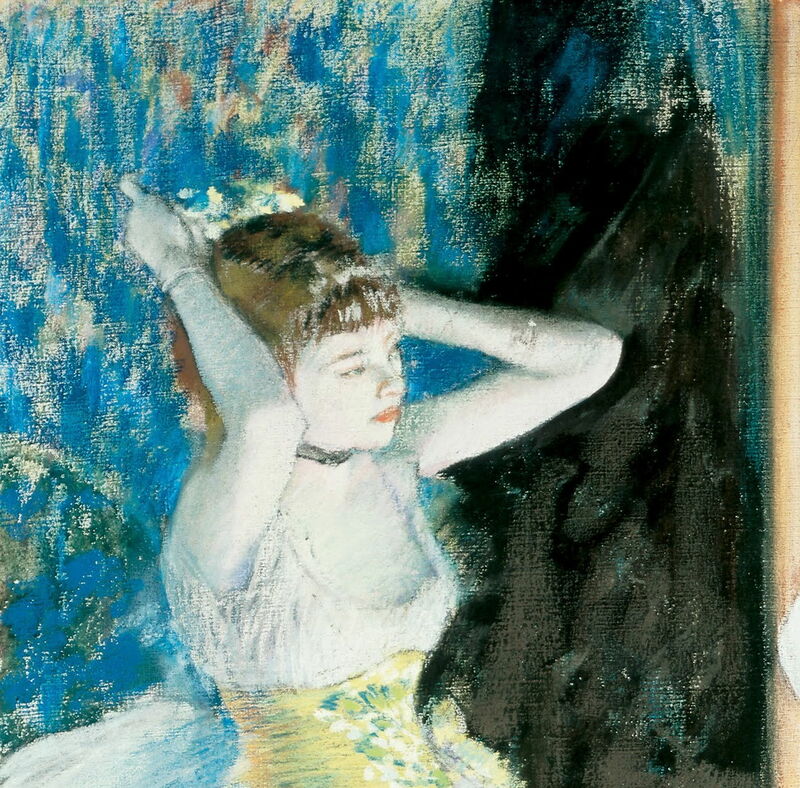 Hilaire-Germain-Edgar Degas (1834–1917), Danseuse dans sa loge (Dancer in her Dressing Room) (detail) (c 1879), pastel and peinture à l’essence on canvas, 37.7 x 87.9 cm, Cincinnati Art Museum, Cincinnati, OH. Wikimedia Commons. Oil paint has been so successful and its paint layers so robust because the pigment is sealed in a protective layer of polymerised oil. Pastels adhere far more tenuously, with precious little to bind them to the ground. Removing the drying oil and adding essentially unbound pigment will inevitably result in a very fragile painting. 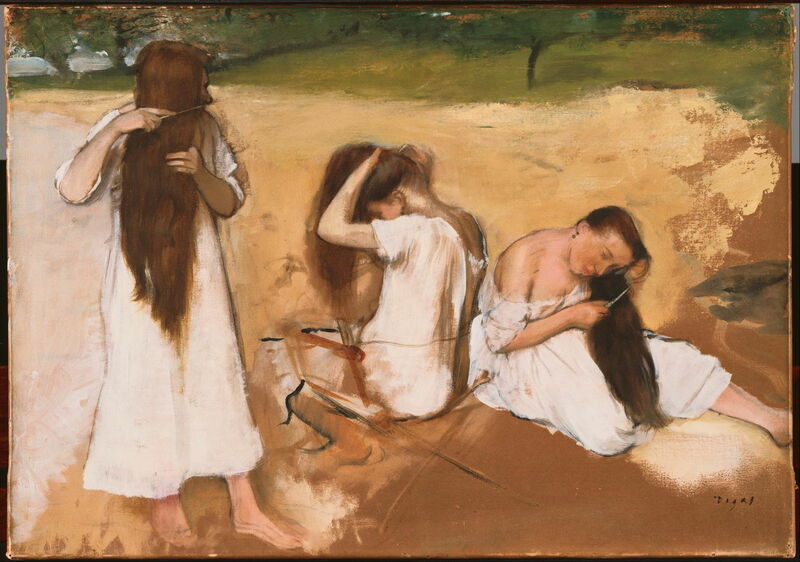 Degas’ Women Combing Their Hair (c 1875-6) is painted in oils, possibly peinture à l’essence, on paper, which again is far from ideal if you want a painting to last. 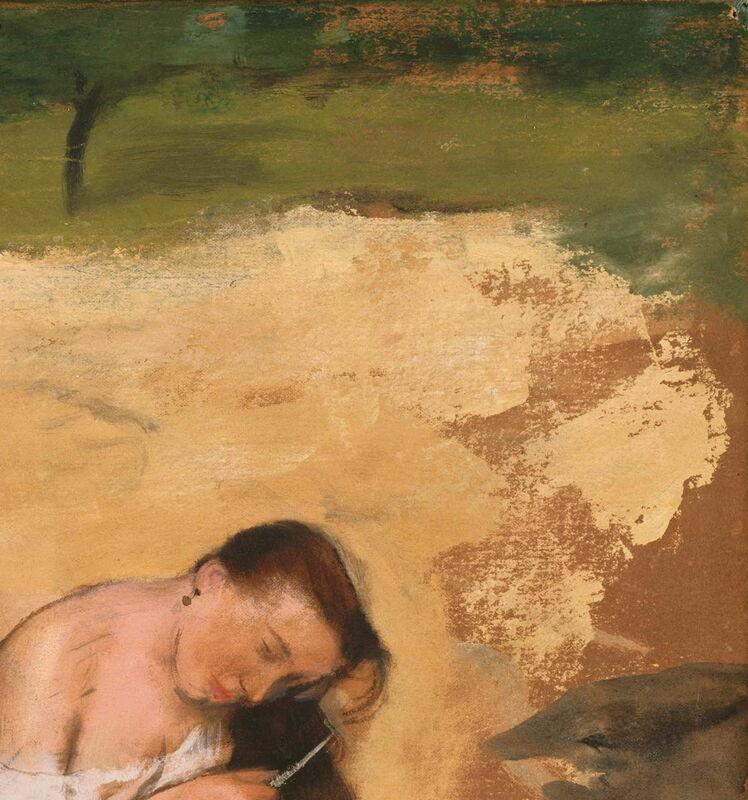 Hilaire-Germain-Edgar Degas (1834–1917), Women Combing Their Hair (detail) (c 1875-6), oil on paper mounted on canvas, 32.4 x 46 cm, The Phillips Collection, Washington, DC. Wikimedia Commons. 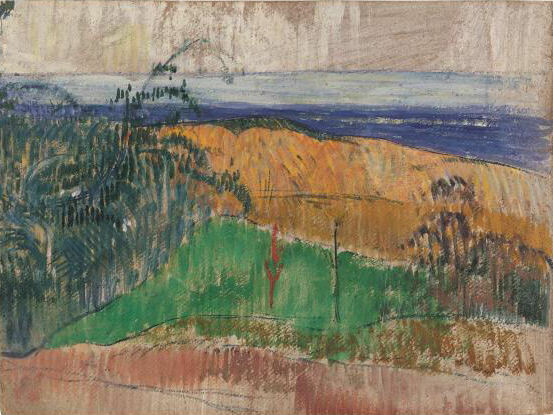 Among the other painters who seem to have used peinture à l’essence are Gauguin, in his Vue de la Plage de Bellangenay (View Of The Beach At Bellangenay) (1889), and Toulouse-Lautrec, in his Danseuse assise aux Bas de roses (Dancer sat at the foot of Roses) (1890) shown below, which follows Degas in combining it with pastels. 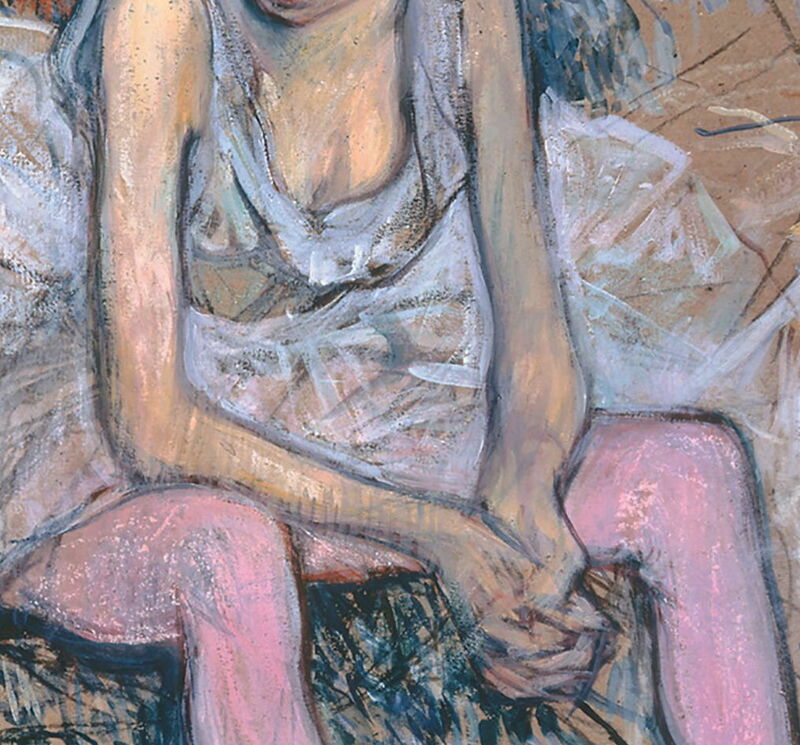 Henri de Toulouse-Lautrec (1864-1901), Danseuse assise aux Bas de roses (Dancer sat at the foot of Roses) (detail) (1890), peinture à l’essence and pastel on board, 56.8 x 46.4 cm, Private collection. Wikimedia Commons. On the other side of the English Channel, the Pre-Raphaelite Brotherhood had also been trying to innovate with oil paints. In their quest to rediscover the brilliance of much earlier works, including frescos, and with the support of Mrs Merrifield’s translation of Cennino Cennini’s fourteenth century Il Libro dell’Arte, these painters tried to create brilliant white grounds. They considered these to be essential in ‘reflecting back’ the light transmitted through the paint layer, and making its carefully layered coloured glazes appear more brilliant. Around 1850-51, William Holman Hunt and John Everett Millais started to paint critical passages directly onto white grounds consisting of lead and/or zinc white whilst those grounds were still wet. 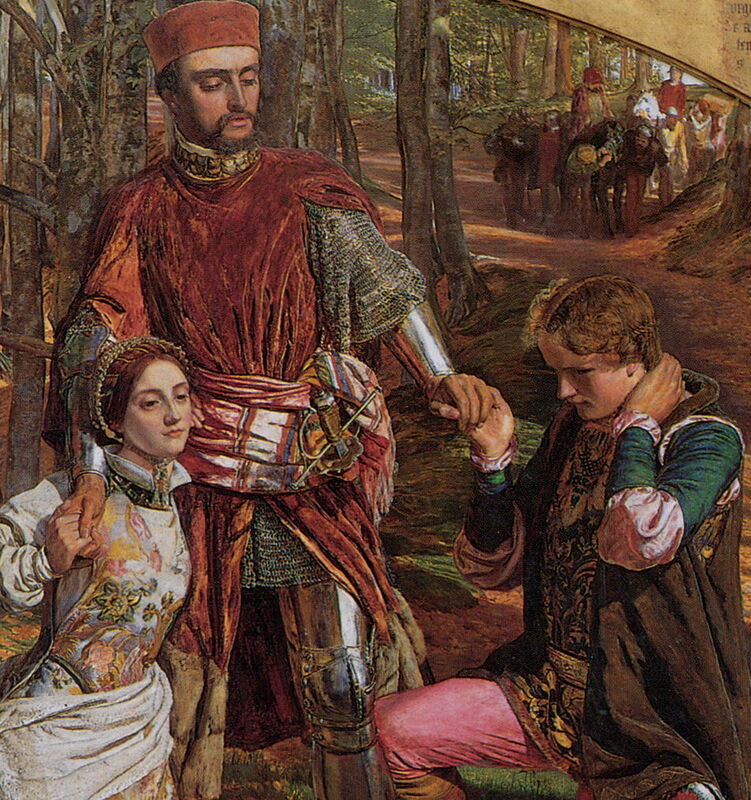 William Holman Hunt (1827–1910), Valentine Rescuing Sylvia from Proteus (1851), oil on canvas, 100.2 x 133.4 cm, Birmingham Museum and Art Gallery, Birmingham, England. Wikimedia Commons. 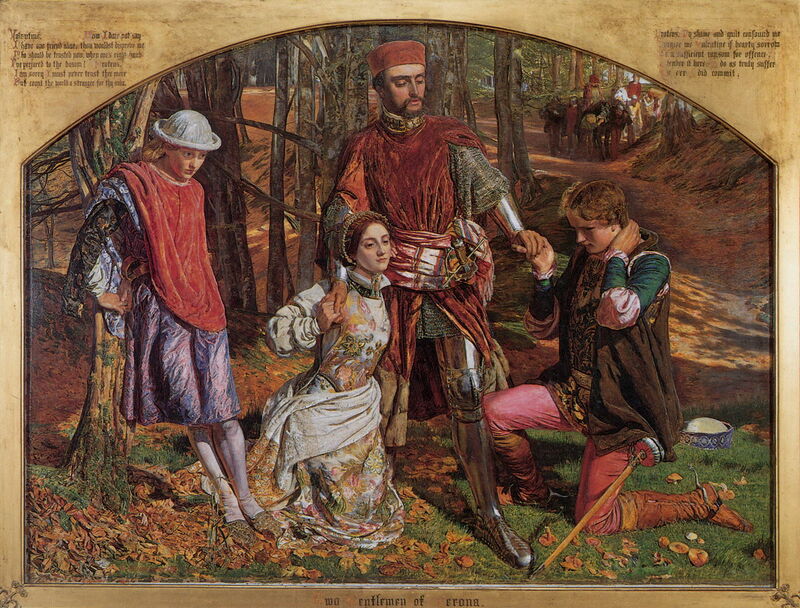 William Holman Hunt’s Valentine Rescuing Sylvia from Proteus (1851) is claimed to have used areas of ‘wet white ground’, although this has not yet been confirmed by analysis of the paint layer. The detail shown below could not be a greater contrast with the paintings of twenty years later in France. William Holman Hunt (1827–1910), Valentine Rescuing Sylvia from Proteus (detail) (1851), oil on canvas, 100.2 x 133.4 cm, Birmingham Museum and Art Gallery, Birmingham, England. Wikimedia Commons. Close examination shows drying cracks in several passages, particularly the right thigh of Proteus (on the right here). The highlight on that thigh is now too bright, and it appears to have been painted using dry pigment mixed into oil paint with the brush, leaving a very granular paint layer. 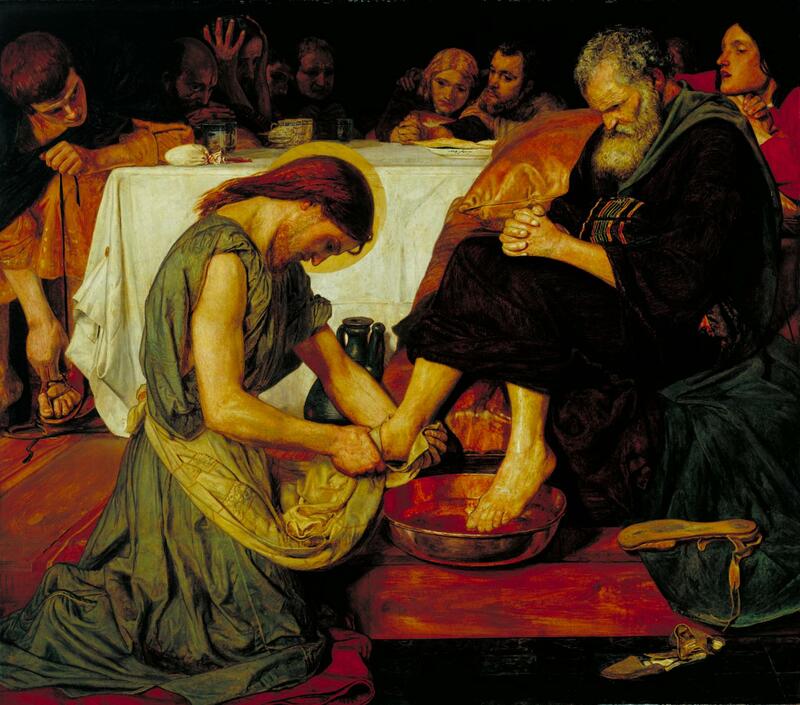 Ford Madox Brown does appear to have used ‘wet white grounds’ in his Jesus Washing Peter’s Feet (1852-6), but Brown found the technical challenge of painting over the still-wet ground was too great. Some of the Pre-Raphaelites also used copal in their paints and varnishes, although none seems to have used much Megilp, despite its popularity in British painting in the nineteenth century. To date – and their paintings are still relatively young – few seem to have suffered any problems with cracking or threats to their structural integrity, but only time will tell whether their white grounds are quietly turning into soap (by saponification, instead of the normal process of ‘drying’ by polymerisation). The late nineteenth century saw oil paint manufacture transformed from a small-scale craft to an industrial process, supported by technical developments of industrial chemists. Tubed paints were augmented by additives, to promote their flow and handling, and achieve a more consistent buttery feel. Together with the introduction of important synthetic pigments, and machine manufacture including even mechanical grinding of pigments, they provided artists with more reliable supplies, allowing the painter greater scope in technique. Brettell RR (2000) Impression, Painting Quickly in France 1860-1890, Yale UP. ISBN 978 0 300 08447 4. Callen A (1987, 2006) Les Peintres Impressionnistes et Leur Technique, French tr of English original, Art & Images. ISBN 978 2 9139 5207 2. Callen A (2015) The Work of Art, Plein-air Painting and Artistic Identity in Nineteenth-century France, Reaktion Books. ISBN 978 1 7802 3355 0. House J (2004) Impressionism: Paint and Politics, Yale UP. ISBN 978 0 300 10240 2. Schaefer I, von Saint-George C & Lewerentz K (2008) Painting Light, The Hidden Techniques of the Impressionists, Skira. ISBN 978 88 6130 609 7. Townsend JH, Ridge J & Hackney S (2004) Pre-Raphaelite Painting Techniques, Tate Publishing. ISBN 978 1 8543 7498 1. Posted in General, Painting, Technology and tagged alla prima, history of painting, Impression, Impressionism, Megilp, Monet, oil paint, oil painting, plein air, Pre-Raphaelite, tubes, wet white. Bookmark the permalink.